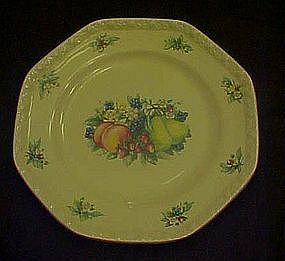 Sweet Country Harvest dinner plate measures 10 1/4" diameter, by Avon. Made of ceramic with a decoration of fruit and vines and lacy border. I have 4 available, Price is for each plate. All are perfect condition. See other pieces I have listed to this set.